When will be Concentration (1958) next episode air date? Is Concentration (1958) renewed or cancelled? Where to countdown Concentration (1958) air dates? Is Concentration (1958) worth watching? 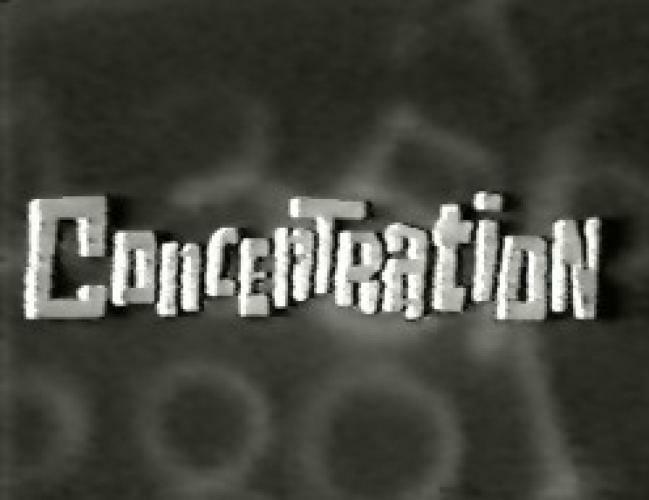 The original version of Concentration was first produced by Dan Enright & Jack Barry, who achieved notoriety by being at the root of the Quiz Show scandals of the late 1950s. Concentration premiered amidst the unfolding of the scandal and congressional hearings, whereupon NBC assumed production of the show. When it left the air in 1973, it was the longest running Game Show in the history of television. It would later be surpassed by The (New) Price is Right, and the syndicated versions of Wheel of Fortune and Jeopardy. There were a few successor versions of Concentration that had much shorter runs. The objective of the game was to solve a rebus (a combination of letters, word fragments, & pictures) hidden behind 30 sequentially numbered puzzle pieces arranged in a six by five grid. If the contestant matched the prizes in their piece selections, a card of the name of corresponding item went into their prize rack displayed behind them on the doors that new contestants entered through. If they matched a 'Take' action, they selected one item from their opponent's prize rack and it was inserted into theirs. If they matched a 'Forfeit', they selected one of their own prizes to give to their opponent. The board always contained 2 or three joke prizes like "dirty dishes" or "a clown nose" that could insure a players prize cache against a Forfeit. After the prize transaction was completed, the two matching pieces were turned to reveal two more pieces of the puzzle. The contestant then had 20 seconds to solve the puzzle. If they guessed correctly, they won all of the prizes in their prize rack, their opponent was dismissed and they stayed on to face a new opponent. There was no penalty for a wrong guess, but a mis-step may have given valuable information to the opponent. After a match, a contestant always maintained their turn and got to select two more pieces. When a contestant turned over a Wild Card it would automatically match any other piece. If the first piece selected was a Wild Card, the atmosphere in the studio got very tense. If the contestant then selected the other Wild Card, they got a (relatively) large prize that was theirs to keep regardless if they won or lost. In the early years of the show it was $500,later increased to $1000, and then to a low-end automobile. This occurance was quite rare as a pair of Wild Cards could only be matched totally from the first viewing of pieces because when first encountered they would always come off the board by virtue of the automatic match. Occasionally, the board was left with two mismatched pieces (by virture of Wild Card matching,) one or both of which may have been concealing key pieces of the rebus, thus stumping the players. If neither played was able to solve the puzzle, a draw was declared. Each player got to carry over three of the prizes in their rack to the next game. Upon losing, there were no second chances. A losing player was dismissed immediately, except in the rare case where their opponent "ran the board" on them and they never got an actual turn to select potentially matching pieces. In later years, it became best two out of three. Championship tournaments were held among the season's 4 best players called The World Series of Concentration. Like the World Series, these were best 4 out of 7. Various kinds of bonus games were incorporated to increase the winner's prize cache, but these were usually simple things like spinning a prize wheel. Through out it's run, the main focus of the show was always about solving the puzzle. It was a game that the home audience could play along with. EpisoDate.com is your TV show guide to Countdown Concentration (1958) Episode Air Dates and to stay in touch with Concentration (1958) next episode Air Date and your others favorite TV Shows. Add the shows you like to a "Watchlist" and let the site take it from there.